The prime minister and his stooges spent the last 7 weeks saying people demanding justice and doubting the government’s will to secure it were ‘talking too soon’. How ironic it is to see now Labour stooges, pretending to have an inch of concern for press freedom, rush to declare the case of Daphne Caruana Galizia closed. How can you say justice has been served before even the conviction of these tools has been secured? And how can you conclude justice has been served when we are no wiser today than we were last week about who thought it would be a good idea to kill Daphne and went about arranging for it? And how can you say justice is served when the political realities that brought about her death, the matters she was investigating and revealing, remain apparently unaffected by her life and by her death? 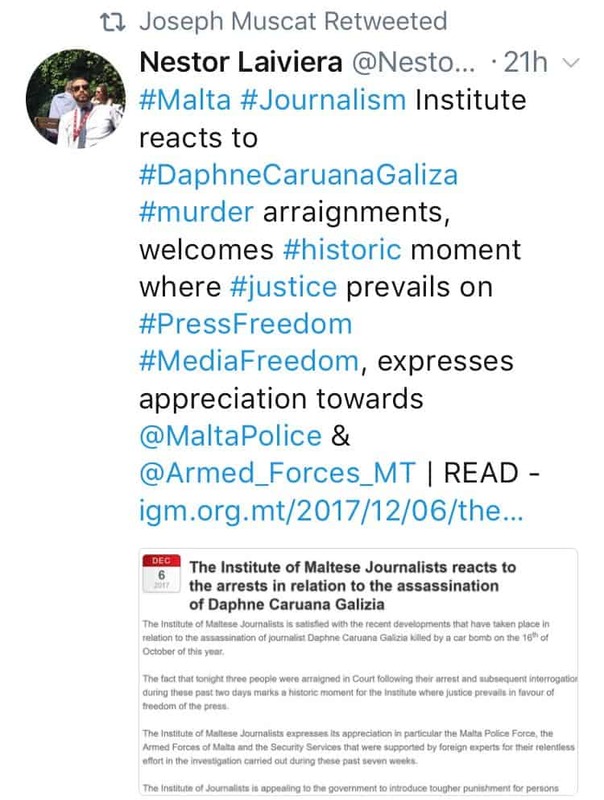 In adopting the government’s hymn book that this case is closed, the institute of Maltese journalists has not merely betrayed Daphne. She is beyond harm now. They did that repeatedly while she was alive anyway and she marched on, alone, every time. In adopting the government’s hymn book that this case is closed they have betrayed anyone in Malta who expects our institutions to protect us from abuse of power, starting with journalists themselves who are supposed to keep a vigilant and critical eye on the processes of the state. Even before the first page of evidence has been presented against these three men, the institute of Maltese journalists has pronounced the case closed, justice served. Now we can all go home in gratitude of our institutions who have protected journalists and press freedom. Protected how? Is Daphne any less dead now? And are her killers, right up to the people who conceived and commissioned her killing, serving time? And are the politicians who isolated her and led her monstrous demonisation retired? And are the police authorities who were supposed to protect her out of a job? But journalists, who marched in sympathy with her two days after she died, wash their hands of her case as soon as they thought it would not look too unseemly to do so, 7 weeks later. It would not have surprised Daphne Caruana Galizia one bit. I am relatively new to this. I could not believe my ears when I sat next to Norma Saliba who runs the institute of Maltese journalists tell MEP Francis Zammit Dimech in a consultation meeting on press freedom, her institute believes journalists should be warranted. Understand what this means. You would need a license from the state in order to write, to exercise the basic freedom of expression. Only “warranted” journalists would have the protection reserved for journalists. The institute of Maltese journalists argues for the denial of protection to people exercising their freedom of expression unless they are permitted to do so by the state. Did you know the USSR too had a Union of Journalists? I can never be a member of a club that believes freedom of expression is a right reserved for people licensed by the state. I can never be a member of a club that rejoices in the arrest of 3 people in connection with the murder of a journalist without knowing why they did it, seeing evidence of how they did it, and having the obvious question of who made them do it answered. I can never be a member of a club that is willing to prejudice the simple safety and freedom of the people in the profession it is supposed to represent because it serves the interests of the regime that wants to silence them. I’d rather be a biċċa blogger thank you very much.